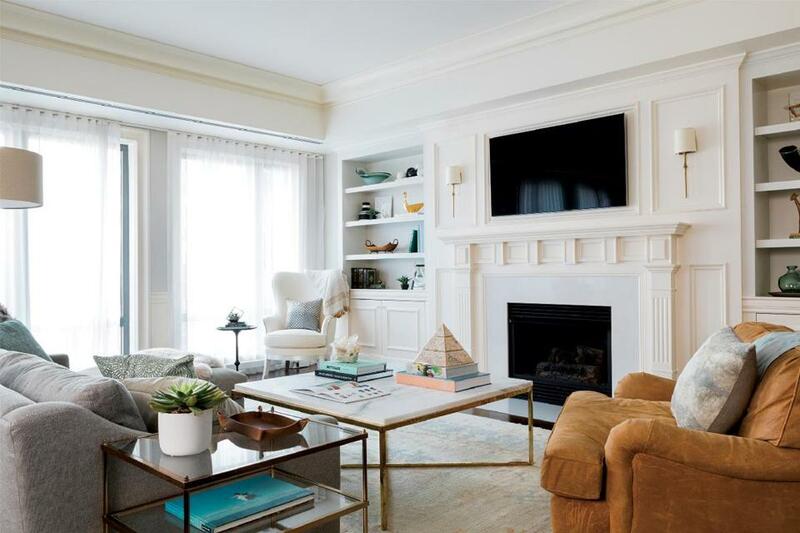 Newlywed homeowners wanted a playful, sophisticated design that lightened their home’s interior. 1. The Veronica wing chair by Currey & Company transforms one corner into a chic reading nook. Its silver-leaf frame and white cotton twill upholstery impart a fresh twist to a classic silhouette. 3. Accessories chosen for color and shape, including a Jonathan Adler brass bird and vintage walnut canoe bowl from Germany, populate the shelves. “The spare but bold forms and finishes echo other elements in the room,” Santosuosso says. 4. Skinny gilded-iron sconces purchased online from Serena & Lily dress up either side of the television. 5. The roll-arm lounge chair in camel-colored waxed suede mirrors the brass accents and stands up to the homeowners’ young dog. 6. Santosuosso designed the quartzite-and-brass coffee table, fabricated by New Antiquity in Connecticut, to be large enough for a group to congregate around for cocktails. 7. The extra-deep slope-arm sofa with chaise upholstered in Belgian linen from Restoration Hardware seats five. Its low profile preserves the sightline to the windows. 8. 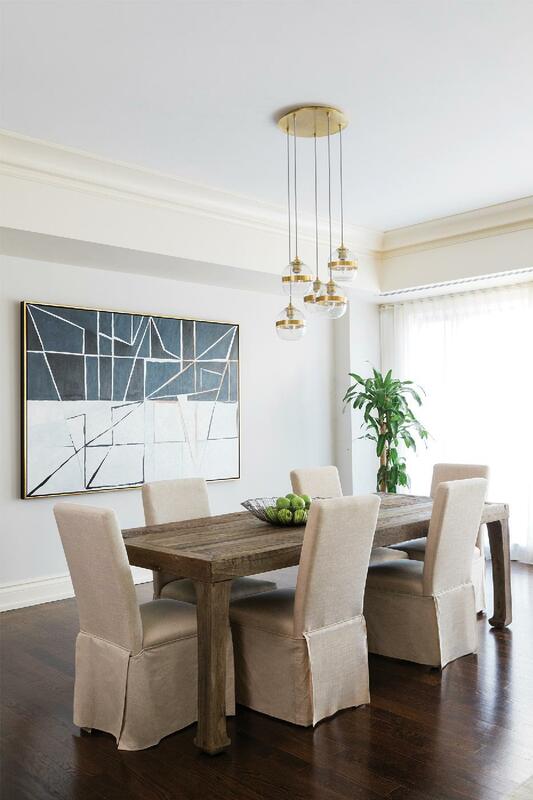 The Asian-inspired vintage-elm dining table from Restoration Hardware is a simpatico counterpoint to the home’s mid-century modern elements. 9. The homeowners commissioned CZ Art Design to create a geometric painting to anchor the large, blank wall. Powers Gallery in Acton edged the canvas in a gold-leafed custom frame. 10. Brass accents on the West Elm chandelier with bubble-glass shades visually connect the opposite side of the room to the living area.